Black Tie versus White Tie! I've received several inquiries about what's the difference between a black tie and white tie event. It's a fascinating topic and there's an interesting history involved if you have a couple of minutes this evening. A while back Miss Helen sent an article from The Wall Street Journal entitled "Style and the Man" by Jamie Johnson in the Saturday/Sunday edition, April 30, 2011. Johnson was writing about the planned celebration of the disputed 125th anniversary of the modern dinner jacket first being introduced in 1886 at a posh resort on Lake Tuxedo in Orange County, New York. But apparently the Prince of Wales, some twenty years earlier in 1865, had asked his tailor Henry Poole & Company in London to design a tail-less dinner jacket. And thus the dispute over dates began. You see, in former decades (make that centuries) dinner jackets had tails both in front and back to guard against the cold. They were split in the middle on both sides to make it easier to walk. And this eventually evolved into the front tails being cut away to make it easier to ride a horse, leaving only the back tails - which survives to this day in certain circles. But when a group of young friends (complaining that the long tails in back interfered with sitting, dining and dancing) showed up at the renowned Tuxedo Park Resort in 1886 with the back tails cut away, it created a shock and scandal not unlike Janet Jackson's famous wardrobe malfunction at the Super Bowl! But the tail-less fashion took hold, both in America and in Europe. It still employed the white tie, cummerbund (original spelling) and silk or satin lapels - just no tails. But in time the white bow tie gave way to the black bow tie. And this is the currently recommended (not necessarily demanded) attire for a Black Tie event. However, White Tie events are still very much alive. Often called 'Top Hat and Tails' it is the most formal dress code in Western fashion - and employs the original dinner jacket with back tails and a white bow tie. You'll see this mostly at state dinners and in diplomatic circles, both in America and in Europe. In a private home it can be considered extremely pretentious and is rarely seen - unless of course Regina herself and Prince Philip are stopping by for dinner. By comparison, Black Tie events are almost informal nowadays. You'll see some gents in dinner jackets and black bow tie, and others in dark suits, even business suits. The terms dinner jacket and tuxedo, by the way, are interchangeable these days. And there's barely a dispute that the name came from the Tuxedo Park Resort. In some uppity old-guard circles, however, the term tuxedo or tux is decidedly eschewed in favor of the original designation dinner jacket. Of curious note, in America we have Tuxedo rental shops where you can rent a dinner jacket for just one evening. This would be for weddings and other reckless events, and it's a cultural phenomena for which I make no apologies. It's just how we are. Cooking Classes? No thank you! I'm frequently asked if my job as butler requires any kind of formal culinary training. As a matter of fact I do find myself in the kitchen quite frequently. On Chef's two days off I myself have to prepare the evening meal - usually just a pasta dish or casserole which the Mister and Missus can heat up later in the evening, whenever they decide they're hungry. And there's often some last-minute cocktail party popping up and no time to run out for hors d'oeuvres. So I have to throw something together in a flash. When this happens, I always remember the advice of famous Washington DC hostess Sally Quinn in her book The Party. Says Quinn, "Food doesn't have to be fancy, it just has to be good." So when I got in a bind one evening without anything at all to serve, I thought about Quinn and sliced up a few frozen micro-waved corn dogs, stuck a frilly toothpick in each slice, and served it with a dip of expensive deli mustard. Presented on a sterling-silver platter along with designer cocktail napkins, it was a hit and not one slice was left. But as for formal culinary training - no, none to speak of except one course in college. Which was by default. The unfortunate thing about going to college is that both the courses and the resulting homework can seriously distract from a person's social life and parties. In this tricky situation, somethings got to give, right? My grades were barely passing, but high enough to keep from being thrown out of school. A buddy at the time who was in similar distress suggested we take some really easy classes to bring up our grade point averages. So one of the choices was a cooking class in the Home Economics department. Huge mistake! We were late the very first day, the only two males in the class. And the instructor said when we walked in, "It seems we have two thorns among the roses this semester." It turned out to be mostly a baking class, and neither one of us really got the hang of it, especially when it came to souffles. And on the mid-term exam our cream puffs came out of the oven without the puff! So we packed them with cream, and they looked more-or-less ok. But when the instructor picked them up she made a comment about how heavy they were. Needless to say our grade point averages did not come up that semester. My employers (out of undisguised self interest) have offered to send me to cooking classes, if I wish. But recalling my humiliation in college, I've been reluctant to do this. However, I've bought a few books, starting with Cooking for Dummies and have begun a serious flirtation with the idea of possibly someday learning how to cook. How's that for commitment? Obviously the more skills you have the better if you want to work in household service. Traditionally my job as butler mostly involves taking care of the silver and the wine cellar, perhaps serving at table and receiving guests at the front door. But it never hurts to have some skills in the kitchen - especially if you have an unreliable party-animal Chef whom you intensely hate. So we'll see. I'd rather learn form a book than go off to some kind of nutty classes. In my capacity here as butler and personal assistant, I just got off the phone making a luncheon reservation for the Missus and her girlfriend. They're off to Manhattan today to do a little shopping at Bergdorf's. So the first thing I did was notify her Personal Shopper there that the Missus is on the way. Having been around in one form or another since 1901 Bergdorf Goodman is the epitome of a world-class, high fashion department store, for both women and men's apparel. In addition to clothing, there's gifts, jewelry, perfumes, china, crystal, silver, stationery, linens, a shoe salon, bridal salon, and a stunning collection of furs. On the penthouse floor (where the owners once lived) you can enjoy a full-service makeover at the celebrated John Barrett Beauty Salon. Sitting at the very crossroads of the fashion world, Bergdorf Goodman is located at 58th Street and Fifth Avenue - right across from the world-famous Plaza Hotel. And by the way, the store occupies the very spot where one of the Vanderbilt Mansions once stood. Plus Tiffany's, Harry Winston and Cartier's all share this not-so-shabby neighborhood. The lunch reservation I made today is for the BG Restaurant on Bergdorf's seventh floor. Although not a large space, this lunch and tea room is the height of elegance and sophistication. You can have a salad, sandwich and a nice glass of wine for $75 or less. Here's a fun link to their current menu. Frequented mostly by ladies who lunch (more likely than not dressed in conservative Chanel suits) you'll also find any number of tourists who've come to enjoy the spectacular views of Central Park and the dazzling buildings on upper Fifth Avenue. If you're planning a trip to New York anytime soon, it's definitely worth your while to browse through this temple of grace and elegance and have a little nosh at BG's. But you can catch that view of Central Park on the north side of any upper floor - not just the restaurant. Why Did You Want To Become A Butler? Over the years I've been asked this question many times in one way or another, and I wish I had a quick, short answer. It's not that I was born wanting to become a butler or picked it out of some career guide booklet. But it seemed to be a natural progression in the life I had chosen. Fresh out of college I found myself in a corporate job sitting in an office cubicle, hacking out newspaper releases for a public relations firm in New York. Good pay, good benefits. But what? Trapped in this cubicle day after day, year after year? All I really wanted to do was to travel and see the world, and the best jobs to accommodate this nomadic desire were all in the service industry. So be it. I took all my business suits to Good Will, and hit the road. If you get a job as a waiter in a top restaurant in Beverly Hills, then you're going home with three-or-four hundred bucks in your pocket every night. Work in the Concierge Department in a five-star hotel for the rich and famous, and five-hundred to a thousand a day is coming your way, especially if a member of the rich Saudi family is spending the night there. Drive rented limos in New York for rich people, and with their tips you might easily expect a hundred dollars an hour. On the other hand, being an English tutor in France or Italy or Germany might bring you only five-dollars an hour. But who cares? You're in Europe, and loving every minute! It was my friend Miss Helen who steered me toward a career in household service. She pointed out that being a butler or house manager or estate manager is the ultimate in service jobs, and high paying as well. It combines all the skills of all service jobs, but allows a much greater degree of flexibility in time, not to mention creativity. So off to butler school I went. And any good school out there also serves as a placement agency. They're expensive and very intense. But there's a definite payoff. Since the salary can range anywhere from $50,000 to $250,000 a year (depending upon the family and responsibilities of course) these are great jobs full of fun, excitement, and all the drama you can handle. Most of these jobs come with corporate benefits: vacation and sick pay, 401k plans, life insurance, Worker's Comp and full health insurance. In addition, if you're a live-in butler like me, then all housing expenses are included - rent, electricity, telephone, and so forth. So most of your salary is going directly into savings. 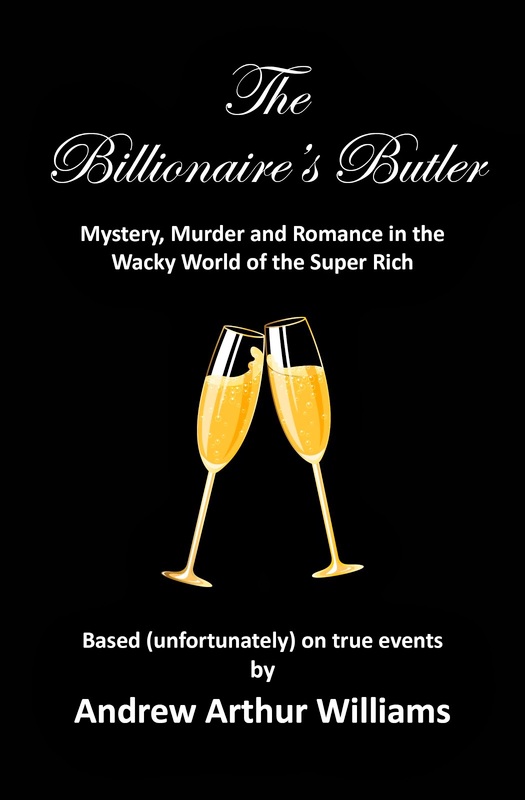 So the big secrete about being a butler is that after ten or fifteen years of service (depending upon your pay scale, of course) you're going to wind up semi-rich yourself, with a million bucks in the bank or more. As nice as this payoff may seem, it's not all about money. Quality of life is a factor, not to mention the hectic, non-stop pace and daily challenges that stretch your strength and imagination on a daily basis. So the bottom line about butler jobs is that you're having fun or learning something new every day, and piling up money in the bank. Being a butler is not my last stop in life. And I have no idea what the future may bring. But for the time being this is a pretty cool job and I'm keeping an open mind as to whatever comes next.